Las Vegas, NV (April 12, 2010) -- Today Petroglyph announced the development of Panzer General: Russian AssaultTM, a strategy board game with a World War II-based setting, to be released this September exclusively in North America. "Petroglyph has released multiple critically and commercially successful strategy games in recent years, and we look forward to releasing another top-quality, independently-developed and distributed board game,â€� said Chuck Kroegel, General Manager of Petroglyph. â€œPanzer General: Russian Assault features a unique setting with a familiar gameplay style that we know both WWII fans and strategy gaming enthusiasts will enjoy." New to the Panzer General game system with this sequel are 80 plastic miniatures depicting tanks, infantry and artillery. There are also over 100 new Action Cards, Units, and Abilities. The game provides 12 solo and two-player scenarios depicting combat situations between the German and Russian forces in such battles as Stalingrad, Kursk, Moscow, Leningrad and many others. Russian Assault takes place in the largest theatre of WWII, the Eastern Front. Units and variable terrain closely depict the different climates and combat situations experienced in this theatre from the Western Front of Panzer General: Allied Assault. Petroglyph takes the Panzer General series to a whole new level of strategy by placing the sequel in one of the most complex and deadliest theatres of the war. Panzer General: Russian Assault will be available from the Petroglyph web store, online retailers, and local game and hobby stores later this year. Published by Petroglyph and under license from UbisoftÂ®. 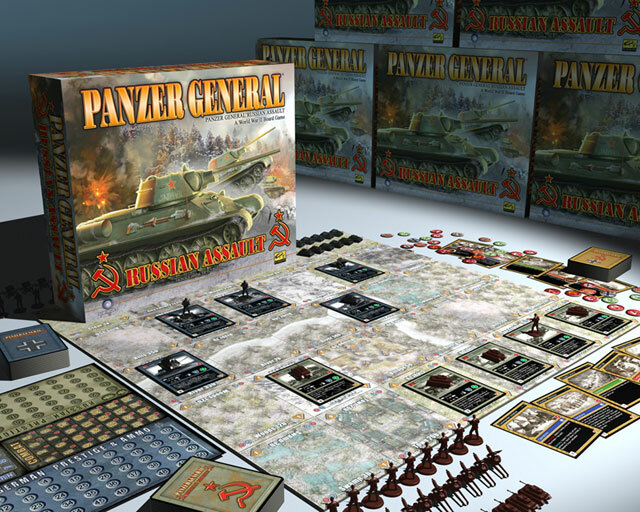 For more information about Panzer General: Russian Assault, please visit http://www.panzergeneralrussianassault.com. Ubisoft is a leading producer, publisher and distributor of interactive entertainment products worldwide and has grown considerably through a strong and diversified line-up of products and partnerships. Ubisoft has teams in 28 countries and distributes games in more than 55 countries around the globe. It is committed to delivering high-quality, cutting-edge video game titles to consumers. Ubisoft generated sales of â‚¬1.058 billion for the 2008-09 fiscal year. To learn more, please visit http://www.ubisoftgroup.com. For more information about Petroglyph, please visit http://www.petroglyphgames.com. Â© 2009 Ubisoft Entertainment. All Rights Reserved. Panzer General, Ubisoft and the Ubisoft logo are trademarks of Ubisoft Entertainment in the U.S. and/or other countries.